Our super smart decluttering hacks were so popular, we went ahead and found some extra! Here’s 10 more super smart organizing hacks for your home. Enjoy! Grab a corrugated box and start organizing your home office or den. Sort through your books—display the ones you like, store the ones you like but take up space, and donate the rest. Repeat this with office supplies, hand-held electronics, kitchen appliances and whatever else you feel needs attention. Keep a brown packing paper roll or two on hand to wrap things up as you put them away. 2. Do you really need that? Ask yourself that the next time you think about buying something. If you hesitate, it’s probably not the best purchase to make. However, if you do buy that winter coat, look at the rest of your collection and decide what to do with the rest. Reverse the way you hang your clothes. Then as you wear something, turn it around the right way again. After 3-6 months, see which clothes are still hanging in reverse. A Space Saver Wardrobe Box is a great way to store whatever you must keep, and the rest you can give away. You’ve heard of the kitchen triangle, right? It’s the relationship between the sink, stove and refrigerator. See how many items are in that triangle, and pay attention to what you use and what just sits there. Haven’t used something in a while? It’s ready to go in a box for storage or donation. 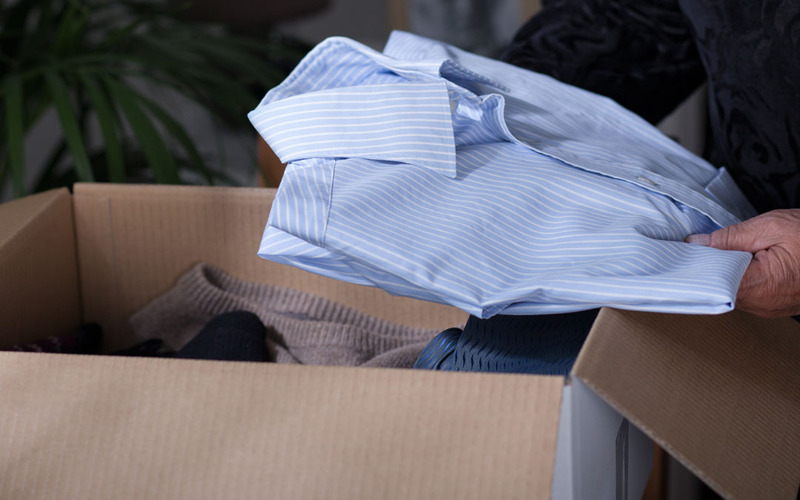 Fabrics can become musty or soaked if they live for a long time in corrugated boxes. Plastic bins with tight seals make for much better homes. They’re great for soft materials and not-too-fragile objects like holiday decorations. But, be wary of storing lights and bulbs in plastic boxes—the depth and lack of cushion may break them. If you’re packing away candles and it takes you several boxes, try to make them all the same size. Your brain likes to create patterns and associations and this is a great way to take advantage. You can even put the candleholders in the boxes, too. Storing small pieces of furniture or even an artificial Christmas tree? A Space Saver Wardrobe Box is the perfect place to put it. Use hand-held stretch wrap to cover up the tree (decorations and all, if you like!) before you store it—or twist the wrap like rope and tie up a bare tree as tightly as possible. Don’t forget your brown packaging tape and void fill such as a brown paper packaging roll, especially if the box is going to move around! Even the best of memories can be totally stumped by an unlabeled box. Grab some tape or labels, a marker or pen, and don’t be afraid of going overboard. Even after you’ve organized everything into categories and storage boxes, go a little further. Try by year, or subject, or something that will be easy and relatable to you. If you’re saving your son’s artwork, don’t put that folder in with your taxes. Maybe you’re 80% done with a room and want to take a break. But you know if you stop, you probably won’t get started again. So just head for the finish line—it likely won’t take you as long as you think. Plus, this way, you’ll really have earned that break. We hope these decluttering and organizing hacks come in handy for you. If you’ve got any you’d like to share with us at The Packaging Company, please do!